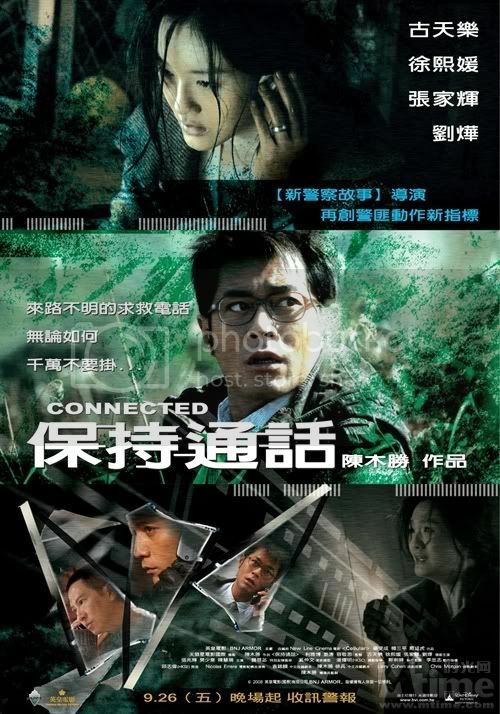 Connected (traditional Chinese: 保持通話; simplified Chinese: 保持通话; pinyin: Bao chi tong hua; Cantonese Yale: Bo chi tung wah; Literal title: Maintain the telephone conversation) is a 2008 Hong Kong action-crime thriller film directed by Benny Chan. It is the first Chinese-language film to remake an American film, as it is a remake of the 2004 American thriller Cellular. The film stars Louis Koo as a man who receives a distressing phone call on his cellular phone from a young woman (Barbie Hsu) who has been kidnapped. The film was released in Hong Kong on September 25, 2008. Single mother Grace was sending her daughter to school when she was knocked down by a car. Half-conscious, she witnesses a brutal murder and is then held captive in a warehouse. The murderer threatens to kill Grace’s family unless she hands over the evidence of his crimes. The helpless Grace manages to repair a spoiled phone and miraculously manages to call Bob, a man working in a finance company. He must now race against time to save Grace and her daughter before it is too late.